Oliver (Stephen Amell) is back from his ‘week vacation’ and he is not ready to go back to work. He plans to disband Team Arrow. His reason for this drastic action, “Chase is right, everyone I’m around suffers or die.” Oliver asks everyone to leave. John Diggle (David Ramsey) asks Felicity (Emily Bett Rickards) and Curtis (Echo Kellum) to give him and Oliver the room. He tells Oliver he shouldn’t be alone, but Oliver disagrees. Team Arrow meets at Felicity’s apartment. Dinah (Juliana Harkavy) and Rene (Rick Gonzalez) join them. Rene is trying to wrap his head around Oliver disbanding Team Arrow. Diggle walks in and tells them Oliver just needs to get his head right. He assures them they aren’t disbanding. They aren’t only in the Adrian Chase business; they are also the last line of defense for Star City. The citizenry still needs their help. Since Oliver has locked them out of the Arrow Cave, John’s wife Lyla, head of ARGUS, will supply them with equipment. Quentin Lance (Paul Blackthorne) enters the Mayor’s office in City Hall. The city council bought his excuse for Oliver being missing for six days. One of the council members thought it was great that he had gone on retreat. Lance doesn’t need Oliver to tell him what Adrian did to him, but only what they are going to do with him. Oliver’s secretary walks in and tells them his “11:00” is there. In walks Adrian (Josh Segarra) acting like business as usual. He thanks Oliver for the time off for grieving for his wife. Quentin points out he wouldn’t have to mourn her if he hadn’t killed her. He wants to talk to Oliver in private, Oliver asks Lance to leave. Adrian puts a knife on Oliver’s desk. The only way Oliver can get rid of him is to kill him. He has made it impossible for the Green Arrow to do anything. Oliver tells him he isn’t going to stab him in the middle of City Hall. Adrian leaves him with the knife to remind him he can’t do anything to him. Oliver informs Anatoly (David Nykl) that he is going back to the island from Hell, Lian Yu, in 48 hours. He has to go back because he needs to be able to explain where he has been for the past five years. Since he has 48 hours left in Russia, Anatoly would like Oliver to help him with a project. He takes Oliver to a Russian hospital with sick poor kids. They have a strain of TB that is lethal. The Bratva can’t afford to buy the specific medication the kids need. Would Oliver like to be involved in a good old-fashioned heist? They go to a drug company and steal the drugs the sick poor kids need. Back to present day Star City, Felicity is at Helix headquarters. She and Alena (Kacey Rohl) are studying surveillance footage to catch Adrian in his Prometheus outfit. They find a shot of him, but his face is pixelated. Alena thinks he has an optics scrambler that pixelates his face. If they can get his optics scrambler, they can reverse engineer it to show his face. Kord Industries made the optics scrambler. Susan walks into Oliver’s office. They are relieved to see each other. Oliver is so sorry for all she has been through because of him. Susan gave a statement to the police, but they didn’t believe her. If Oliver would collaborate her statement, they might take action. She understands he might be reluctant to do it since it would expose him as the Green Arrow. That isn’t the reason Oliver won’t make the statement. Adrian has probably thought this out and has a plan for it. He again apologizes to Susan and tells her they can’t be together because he doesn’t want his life to touch her life. Oliver meets Anatoly at the Arrow Cave. He wants the Bratva to kill Adrian Chase. Anatoly is glad to do it but it won’t be free. He’ll need a form of payment from Oliver. The Bratva needs to rob a few places and he doesn’t want any interference from the police or Team Arrow. Oliver agrees the first robbery is a down payment, the second robbery takes place after they kill Chase. Anatoly reminds Oliver he was right about everything he said about the hood and trying to separate the monster from himself. He is glad Oliver has come to his senses. Anatoly jokes it is hard always being right. Team Arrow gets an alert that a robbery is taking place at Baton Medical. The team suits up. The robbers are after diabetes medicine. Dinah takes out two of the robbers on her own. The rest of the team engages the robbers but Diggle is surprised when Anatoly shows up. He asks why they are robbing this place; he tells him they got the okay from Oliver. John goes to City Hall to confront Oliver. He can’t believe Oliver hired the Bratva with the promise of stolen drugs to kill Chase. Oliver explains that he didn’t want Chase’s death on the team’s conscience. He is trying to protect them. John asks if he is willing to sell his soul, he is if it will protect their souls. Oliver takes responsibility for all the bad things that have happened, including the deaths of Tommy, Laura, and his mother. He orders John to stand down. Back at the temporary Arrow Cave, Felicity’s apartment, Team Arrow meets again. Rene can’t believe Oliver would let the Bratva rob this company. This robbery could pull this company under, causing Star City to lose hundreds of jobs. Diggle informs the group that Prometheus is in Oliver’s head. He needs to talk to Felicity alone. When they walk out of the room, Curtis looks at Felicity’s laptop. He sees what Felicity is doing with Helix. John tells Felicity they both need to talk to Oliver as a united front. Felicity disagrees with John, maybe Oliver is right and the best way to get rid of Adrian is to have the Bratva kill him. Oliver and Anatoly meet. Anatoly explains that with the pills they are going to steal in the next robbery, they will mix the diabetes medicine with it to create a drug that is more potent than heroin. Oliver is distressed to hear this. He asks why the Bratva is doing this. Anatoly confesses times have been hard for the Bratva and they need the money. John and Oliver meet again. “This isn’t you,” John starts with. “I don’t need your protection. What did Chase do to you?” Oliver explains his mindset, “He showed me the truth about myself. The crusade is a lie. I won’t have you participate in my murder spree.” He asks John not to interfere again. He pleads with him to let his crusade die. Curtis, Dinah, and Rene are alone. Since Oliver is gone, and Felicity is never around, Curtis says Diggle is the new Oliver, he is the new Felicity but who is the new Diggle. Both Dinah and Rene claim to be. Dinah lets Rene have it. Curtis points out what Dinah did was a very ‘Diggle’ thing to do, so Rene agrees Dinah is the new Diggle. As the only Rene Ramirez, why are they trying to keep the Bratva from killing Chase? The real Diggle walks in and tells the group this isn’t about saving Chase’s life, it is about saving Oliver’s soul. Using the information Oliver gave Anatoly on Adrian’s schedule the Bratva attempt their hit on Chase. Unfortunately, for them Team Arrow arrives to stop their assassination attempt. Anatoly asks Diggle don’t you want him dead. Diggle responds not this way. Chase slips away from the fight and Curtis pursues him. Chase easily beats him up, but that wasn’t why Curtis fought him. He wanted to get close enough to steal his optics scrambler. At City Hall the Feds tell Mayor Queen since DA Chase’s schedule was leaked, they will place him in Witness Protection. Adrian whispers to Oliver that he is surprised he tried something. Oliver tells him it isn’t over yet. Oliver goes over to Diggle’s house and punches him. John doesn’t hit him back; instead, he has an emotional heart to heart with Oliver. He tells Oliver, “You and me, we’ll never be done. I know the kind of man you are. I’m not going anywhere.” He reminds Oliver that he killed his own brother and was willing to rot away in jail for a crime he didn’t commit to atone for killing his brother. Oliver told him then the best way to atone is through Spartan. That is what Oliver needs to do, atone his actions through being the Green Arrow. Oliver doesn’t think he is worthy of being the Green Arrow. John suggests he work to become the man who deserves it. Oliver just needs to ask for help. Oliver and Anatoly meet again but this time it is on a rooftop. Oliver has changed his mind about the Bratva killing Chase. Out of friendship, he asks Anatoly to stand down. They won’t kill Chase but they made a deal, they aren’t leaving without the second part of their payment. Oliver meets with Team Arrow minus Curtis and Felicity. He called off the hit but the Bratva won’t back down. He tells them he didn’t want to corrupt them more than he had already corrupted them. Diggle had suggested he put his faith in his team. They assure him they have his back. Two simultaneous heists take place. The one Felicity and Curtis pull off at Kord Industry and the one the Bratva attempt to pull off at ZARN Corp. Felicity and Curtis find the decryptions key and use the T-sphere to download it. It is not as easy at ZARN Corp. There is a standoff between Team Arrow and the Bratva. Anatoly has an insurance policy, hostages. Oliver orders the team to rescue the hostages and he’ll deal with the Bratva. The team in an exciting fight scene free the hostages, Oliver shoots the alarm forcing Anatoly, and his men to leave the building empty handed. Curtis and Felicity show up at the Arrow Cave with the optics scrambler. Felicity is able to break the encryption and show Adrian’s face in the video. Dinah happily offers to take this evidence to the police. Felicity is going to post it online so everyone can see that Adrian Chase is Prometheus. The team is back. Oliver isn’t ready to wear his Green Arrow uniform yet, but with his team behind him, it will be sooner than later. Oliver and Anatoly distribute the medicine to the kids. Anatoly thinks the Bratva can go back to its roots and help people again. Anatoly voices a concern that without Oliver by his side, he worries what he’ll become. He tells his good friend they will celebrate before he leaves for Lian Yu. 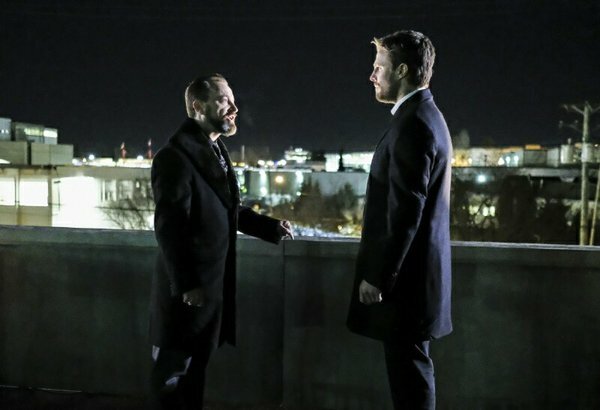 Back in Star City, Oliver and Anatoly meet again, but unlike in the past this isn’t a friendly get together. He is going to go back to Russia but he is leaving some of his best men to get revenge on Oliver for breaking his vows to Bratva. Oliver is disappointed in Anatoly for betraying their friendship. The man he knew would never have done the things he is doing in Star City. He is no better than Gregor. Anatoly reminds Oliver he told him he was worried what would happen to him when Oliver left. He had to do bad things to keep Bratva together, to stay alive. The two old friends part as enemies. At the police station, Lance tells the surrounding officers that three experts have authenticated the video. They should call the Feds so they can arrest him. The Feds protecting Adrian get a text. Adrian can feel that something is up so he attacks both federal agents and kills them. A bloodied Adrian steals their car and while a caravan of police cars fly past him, he whistles to the song on the radio “It’s a Beautiful Morning”. Oliver is in a bad place, a very dark horrible place. I think Adrian broke Oliver by confirming what Oliver always thought about himself. Since Oliver’s boat sunk he has had to do many horrific things just to survive. He sees himself as a broken person who damages those around him. Maybe with Adrian being a broken person himself he can identify it in someone else and exploit it. David Nykl gave a great performance as Anatoly. He did a nice nuanced job of showing the difference between Anatoly five years ago and present day Anatoly. Five years ago he was brighter funnier person. Even though he was a gangster, he wasn’t a bad guy. Present day Anatoly is someone burdened by his responsibilities and has made decisions to keep the Bratva together that have hardened him. Now he is both a gangster and a bad guy. It would be nice if Oliver could do for Anatoly what Diggle has done for him. This was an excellent episode, the acting was top notch, and the action scenes were well done. They have set up things really well for the final five episodes. If they are going to have the guest stars the media has been reporting on the last few days, the end of this season could be spectacular.